I had to take my car into for an oil change and tire rotation today. The representative promised me the service would only take an hour or so and I had a book to read, so I went to the waiting room and sat down. The waiting room pleasantly surprised me, though. It was a lot nicer than the typically bland waiting rooms you would see in doctors’ offices. It left those types of waiting rooms in the dust. This car dealership’s waiting room (it wasn’t even a sales waiting room – it was a service one) not only had a couple of magazines and fairly comfortable chairs like most mediocre waiting rooms, but it also had a big screen TV, popcorn machine, wireless Internet, a coffee maker, a bowl of fruit, three vending machines (if you need them), and computer workstations. The wireless Internet and computer workstations impressed me the most – you don’t see them in waiting rooms very often. The best thing about this waiting room was it made the wait bearable. I was able to get a bag of popcorn, check my email, and read my book while I waited for almost an hour. Like a lot of people, I usually find myself going crazy from boredom after 15 or 20 minutes in a doctor’s waiting room. If I waited another half hour or forty five minutes in this particular waiting room, it wouldn’t have been a big deal or an inconvenience. I had plenty to do to keep me busy and the experience was pleasant. If you are going to have a waiting room, invest the time and money in making it a nice place to be. If you find your customers having (or choosing) to wait often, it makes the investment even more valuable. 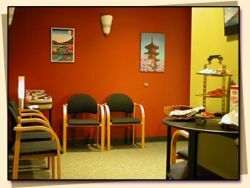 Creating a superior waiting room is not rocket science – it is just a matter of dedicating a little bit of time and the money to doing it. Once you do it, it’s pretty much done. However, the rewards will continue for a long time. Your great waiting room room can make a longer wait tolerable, and maybe even enjoyable for your customers. That should be worth it right there. The “waiting room” is a part of our culture that is almost always used in a negative connotation. You don’t think of people liking the concept of “waiting.” In general the waiting room is a place where stress rules. – Private waiting rooms (where the area is managed by one business): doctor’s offices, hair salons, car washes, car dealerships. – Public waiting rooms, where the area is jointly used by many businesses: airports, hospitals, railway stations. Other than the hair salon, any of these places are full of stress. Will my plane leave on time? How much will my car repair cost? Can the doctor make me feel better? Will the doctor find some hidden issue I don’t know about? At public waiting areas you have to pay for amenities – but you will find wireless internet, Starbucks and other services at airports. In private waiting areas like car dealerships it is amazing what you can find these days: A Volvo dealer in Chicago has 3 Waiting areas including a Child Playroom, a Quiet Waiting Room, and a TV/Movie Room. Many dealers offer free loaner cars of shuttle services so you can AVOID the waiting room. A dealership in Louisville has lounge furniture arranged around a fireplace, above which a flat-screen, plasma television is mounted and you have large windows overlooking the service area, allowing customers to watch as their vehicles are repaired. Even think of the car wash. It doesn’t matter how old I get, I am still entranced by the windows that let me see the big brushes and soap pouring out. Who was the customer service genius who first added windows to a car wash? But then you think of the most stressful waiting room – the doctor’s office. In most cases (I’m sure some of your readers have seen the exceptions) the doctor’s waiting room looks the same today as it did 30 or 40 years ago. It would be great to see these service ideas enter the medical profession. Thanks for the insightful comment. That is a great observation about the stress levels for the various waiting rooms. Doctors would definitely benefit by having more relaxing waiting rooms. Their offices and practices in general seem cold and distant more often than warm and inviting, which is unfortunate. The better car dealers seem to invest some money into their waiting rooms and customer service. The industry is so competitive that every little thing not only counts, but is sometimes necessary. That is truly an exceptional waiting room! I am lucky if the place I bring my car has magazines from the current year. I know the feeling. All we can do as customers is choose to use companies that go above and beyond by having superior waiting rooms, etc.